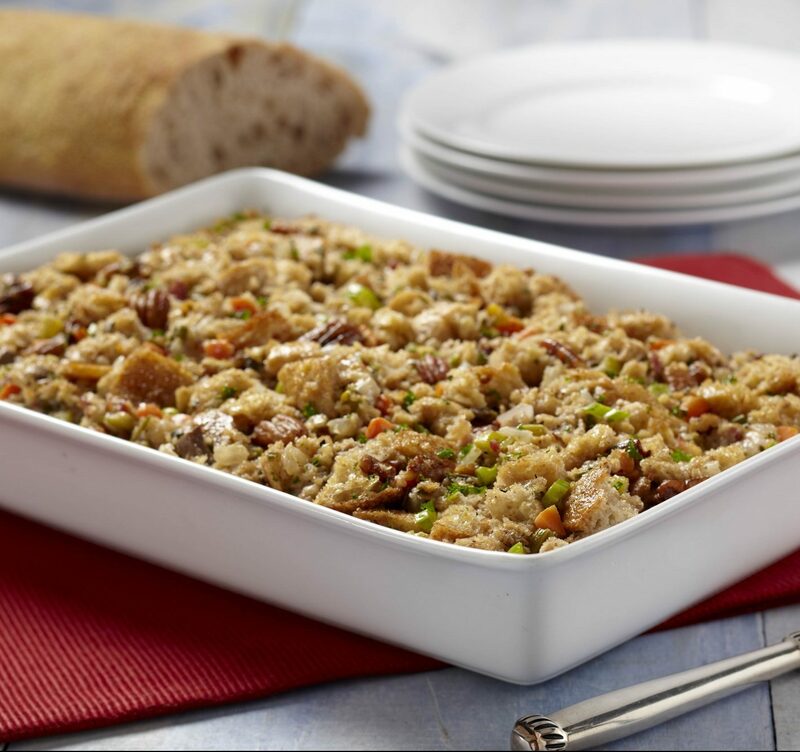 Celebrate the Holidays with Chabaso Ciabatta Stuffing! Any of our Chabaso Artisan Ciabattas is the perfect bread for your holiday stuffing. Sure to please all your guests during the holiday season! 1. Preheat oven to 350°F. Using non stick cooking spray, coat a 15 x 10 x 2 inch glass baking dish. 2. Melt 2T of butter in heavy large skillet over medium heat. Add pancetta and sauté for about 10 minutes, until golden and crisp. Using slotted spoon transfer pancetta to a large bowl. 3. Melt remaining 4T of butter in skillet over medium-high heat and add garlic, onions, celery, carrots, mushrooms, rosemary, and sage. Sautee until the onions are tender, about 10-12 minutes. 4. Remove from heat and stir in nuts and parsley. Add the mixture to the bowl with pancetta. 5. Add cheese and Ciabatta bread, toss to coat. 6. Add enough broth to the stuffing mixture to moisten. 7. Season the stuffing with salt & pepper. Mix in the eggs. 8. Transfer to prepared dish. Cover with foil and bake for about 30 minutes or until heated through. 9. Uncover and bake for about an additional 15 minutes, until top is golden & crisp. Enjoy!